Alan was born in Berkeley in 1949 and graduated from Harry Ells High School in Richmond in 1967. He attended Colorado State University on a football scholarship, where he received a B.A. in U.S. History in 1971. He received a Juris Doctorate degree from Lincoln Law School in San Francisco in 1981. Since 1982, Alan has been practicing law through private practice. Prior to law school, he was employed by the DMV, taught school for the Richmond Unified School District, owned and operated a process serving company, and was a Deputy Probation Officer with Alameda County. Alan was raised in Ashland Lodge in 1987 and became Master of Crow Canyon Lodge in its inaugural year of 1990. He was also President of the Castro Valley Rotary Club in 1990-91. Alan is a member of the Past Masters Unit. 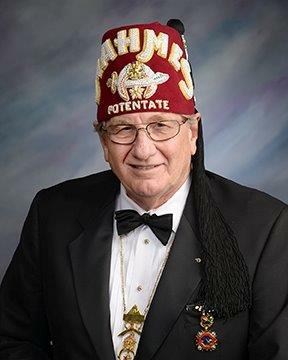 He is a member of Scottish Rite, Class of 1992, and became a Shriner that same year. Alan has two daughters, Jacquelyn and Penny, both of whom were Honored Queen of Job’s Daughters, and a son, Joe, who was a member of DeMolay.